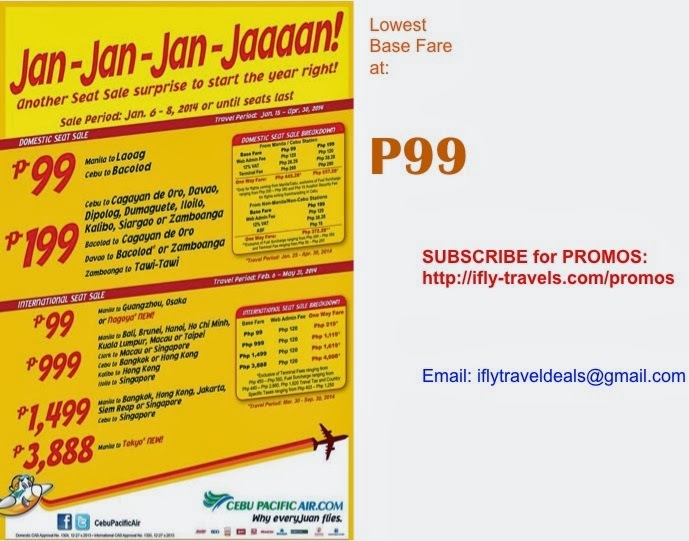 Cebu Pacific Promo Fares: JAN-JAN-JAN-JAAAAN! Another #CEBseatsale surprise to start the year right! P3,888- Manila to Tokyo* NEW! For flight inquiries, we would only prioritize those who filled our BOOKING FORM online (http://www.ifly-travels.com/book-flight/). We will try our best to respond to all inquiries. Kindly note that we have tons of emails to deal with. FIRST COME, FIRST SERVE basis only. Please Note: We are charging a VERY MINIMAL processing fee only. How much fare uae to manila the fight will be on sept 2014? magkano abotin manila to cebu sa JAN 31 po ang lipad...pakireply nlang po sa email veronillao@yahoo.com....at saan po magpa book..